Good morning. Conditions are almost summer-like this morning, with lows coming down only into the low-70s for much of the region, with dewpoints not far behind. Southerly winds, too, are pumping moisture inland to set up the potential for storms late tonight and Thursday morning, and we’ve got full details below. Easter weekend also continues too look good, weather-wise. Today will be a mostly cloudy affair, with highs perhaps getting up to around 80 degrees for most of the region with lots of humidity. Houston should see some scattered showers later this afternoon, but they’re likely to be of the light-to-moderate variety as the atmosphere won’t be ready to break open just yet. South and southeast winds will blow all day, gusting at times to around 20 mph. 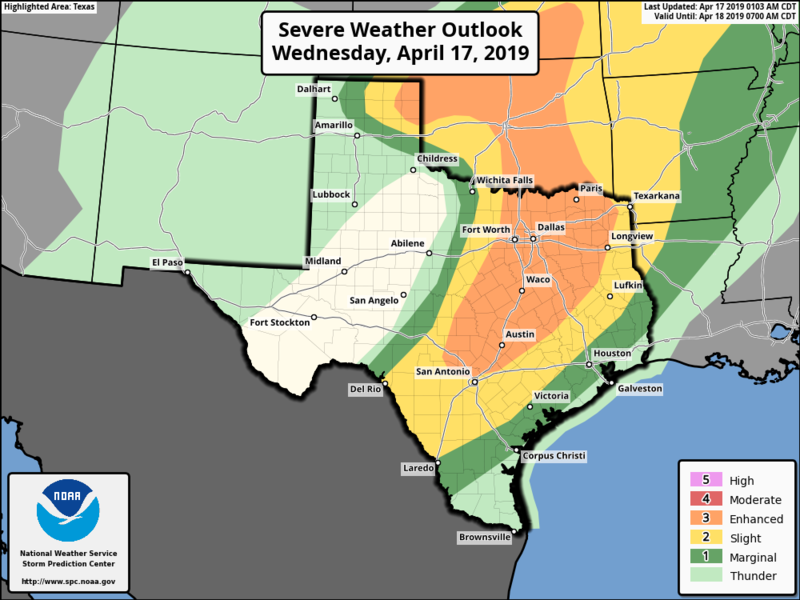 A line of severe weather will develop before midnight to the west of the Interstate 35 corridor, and progress eastward across the state on Thursday morning. 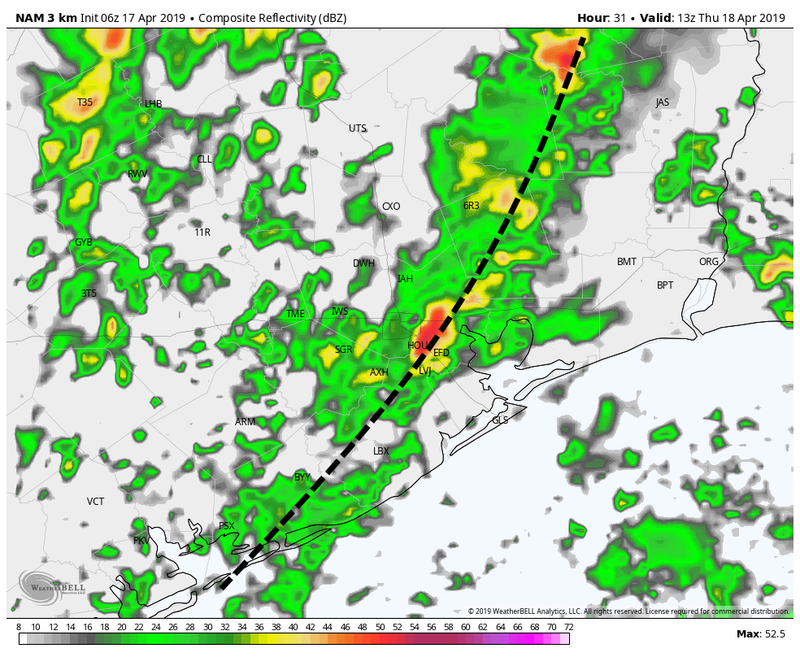 For areas west of Houston (and Katy) and north of Houston (and The Woodlands) chances are that some of these storms will hold together to present a threat of heavy rainfall, and perhaps some hail. But a fairly strong capping inversion should hold over the metro region itself, and the effect should be a breaking of the line of thunderstorms as it near the Houston region around sunrise. Here’s how the NAM forecast model depicts the “line” of storms at 8am Thursday. The bottom line is that conditions will be fine today and likely this evening for the Houston region, with just some scattered showers. The bigger concern will come around sunrise on Thursday, in the midst of rush hour, with the potential for strong thunderstorms. For now we think Houston will see some downpours at that time, but nothing too severe that lasts too long. Accumulations close to 0.5 inch are likely near the coast, with perhaps 1.5 inches of rain for inland areas like The Woodlands. We’ll have a comprehensive post up by 6:30am CT Thursday with the latest. Any remnant showers should exit the region by around noon on Thursday, or shortly thereafter, and drying air will help lead to clearing skies. The afternoon and evening should be breezy, and overnight temperatures should fall into the 50s. Friday will be sunny, with highs in the mid- to upper-70s. The only concern we have for that day is that it will be breezy, with winds possibly gusting above 20 mph. 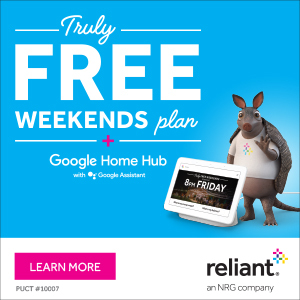 The holiday weekend still looks very nice for Houston. Saturday will start out in the upper 50s for most of Houston (except the coast, which will be warmer), and climb into the low 80s under sunny skies. At some point on Saturday, winds will veer back to come out of the south, to allow some humidity to return. But we still expect a nice day for Easter Sunday, with highs in the low 80s, and partly to mostly sunny skies most likely. Rain chances this weekend are pretty much zero. Slight rain chances return Monday and increase through Wednesday, although we’re not expecting anything too serious in terms of precipitation. Highs for much of next week are likely to be in the 80s, with lows in the 60s, as we’re now not all that far from summer. That should say risk around sunRISE on Thursday, not sunset right? The phrase “The bigger concern will come around sunset on Thursday” should probably be changed to Sunrise……. Heading to Dallas Thursday around noon. What should we have in store for our drive? Thanks! Clearing skies. Should be just fine. I dunno. Are you heading to a Home Depot or a Kroger? How quickly are we expecting these storms to move east? My wife is supposed to drive to Beaumont for work that morning, and I’m wondering if she waits for the worst to pass, will she just catch up to it headed east? They’ll be moving quickly. But right now, if she leaves at 8 or 9am, she may be right in the middle of them. Eric would you kindly explain ‘capping inversion”? Thank you. I tried to post links here, but I guess that is disallowed. In short, a cap is a layer of air that prevents convection or limits the dynamic lifting required to spawn thunderstorms. Another way of describing a cap is that it is a layer of stable air aloft. Considering that, typically, air temperature decreases with height in the atmosphere, and inversion is a layer of the atmosphere where temperature INCREASES with height. This tends to inhibit the rise of air parcels that can contribute to the lift mentioned above. A good source with a lot of information can be found at theweatherprediction.com and weather.gov/jetstream/skewtplots. Sorry, I had to go back and approve those comments manually, Tim. Ah, okay; sorry to cause extra work for you with this. But, on this thread, maybe a worthwhile post during the dog days of endless summer high pressure and not much to write about here could be some rudimentary meteorology, especially as it applies to the Gulf Coast area, and/or with a few links to the sites you find most helpful/educational. Just a thought… Thanks! Could you start including a forecast for Ironman Texas like you did for the Houston marathon? Would be greatly appreciated by many athletes in the area!!!! Rain? I’ll believe it when I actually get some in my rain gauge. Next week, please include the MS150 in your forecast. Thank you. Put in an outlook this morning!